Whatever the shape and size of the Reproduction. individual cell, cell-filament or cell-colony, the immediate visible results of active nutrition are elongation of the cell and its division into two equal halves, across the long axis, by the formation of a septum, which either splits at once or remains intact for a shorter or longer time. This process is then repeated and so on. In the first case the separated cells assume the character of the parent-cell whose division gave rise to them; in the second case they form filaments, or, if the further elongation and divisions of the cells proceed in different directions, plates or spheroidal or other shaped colonies. It not unfrequently happens, however, that groups of cells break away from their former connexion as longer or shorter straight or curved filaments, or as solid masses. In some filamentous forms this "fragmentation" into multicellular pieces of equal length or nearly so is a normal phenomenon, each partial filament repeating the growth, division and fragmentation as before (cf. figs. 2 and 6). By rapid division hundreds of thousands of cells may be produced in a few hours, and, according to the species and the conditions (the medium, temperature, etc. ), enormous collections of isolated cells may cloud the fluid in which they are cultivated, or form deposits below or films on its surface; valuable characters are sometimes obtained from these appearances. When these dense "swarms" of vegetative cells become fixed in a matrix of their own swollen contiguous cell-walls, they pass over into a sort of resting state as a so-called zoogloea (fig. 3). 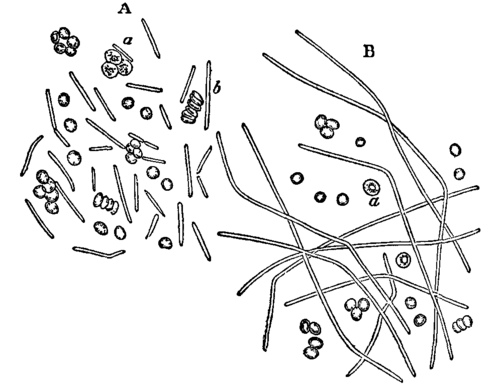 a, a chain of motile rodlets still growing and dividing (bacilli). b, a pair of bacilli actively growing and dividing. p, a rodlet in this condition (but divided into four segments) after treatment with alcoholic iodine solution. 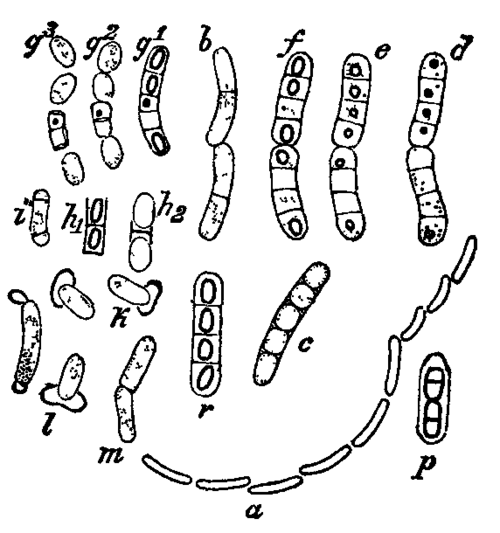 c, d, e, f, successive stages in the development of the spores. r, a rodlet segmented in four, each segment containing one ripe spore. h1, h2, k, l and m, successive stages in the germination of the spore. A. Bacilli mingled with blood-corpuscles from the blood of a guinea-pig; some of the bacilli dividing. B. The rodlets after three hours' culture in a drop of aqueous humour. They grow out into long leptothrix-like filaments, which become septate later, and spores are developed in the segments. One of the most remarkable Zoogloeae. phenomena in the life-history of the Schizomycetes is the formation of this zoogloea stage, which corresponds to the "palmella" condition of the lower Algae. This occurs as a membrane on the surface of the medium, or as irregular clumps or branched masses (sometimes several inches across) submerged in it, and consists of more or less gelatinous matrix enclosing innumerable "cocci," "bacteria," or other elements of the Schizomycete concerned. Formerly regarded as a distinct genus - the natural fate of all the various forms - the zoogloea is now known to be a sort of resting condition of the Schizomycetes, the various elements being glued together, as it were, by their enormously swollen and diffluent cell-walls becoming contiguous. The zoogloea is formed by active division of single or of several mother-cells, and the progeny appear to go on secreting the cell-wall substance, which then absorbs many times its volume of water, and remains as a consistent matrix, in which the cells come to rest. The matrix - i.e. the swollen cell-walls - in some cases consists mainly of cellulose, in others chiefly of a proteid substance; the matrix in some cases is horny and resistant, in others more like a thick solution of gum. It is intelligible from the mode of formation that foreign bodies may become entangled in the gelatinous matrix, and compound zoogloeae may arise by the apposition of several distinct forms, a common event in macerating troughs (fig. 3, A). Characteristic forms may be assumed by the young zoogloea of different species, - spherical, ovoid, reticular, filamentous, fruiticose, lamellar, etc., - but these vary considerably as the mass increases or comes in contact with others. Older zoogloeae may precipitate oxide of iron in the matrix, if that metal exists in small quantities in the medium. Under favourable conditions the elements in the zoogloea again become active, and move out of the matrix, distribute themselves in the surrounding medium, to grow and multiply as before. If the zoogloea is formed on a solid substratum it may become firm and horny; immersion in water softens it as described above. The growth of an ordinary bacterium consists in uniform Measurement of growth. elongation of the rodlet until its length is doubled, followed by division by a median septum, then by the simultaneous doubling in length of each daughter cell, again followed by the median division, and so on (figs. 13, 14). If the cells remain connected the resulting filament repeats these processes of elongation and subsequent division uniformly so long as the conditions are maintained, and very accurate measurements have been obtained on such a form, e.g. B. ramosus. If a rodlet in a hanging drop of nutrient gelatine is fixed under the microscope and kept at constant temperature, a curve of growth can be obtained recording the behaviour during many hours or days. The measured lengths are marked off on ordinates erected on an abscissa, along which the times are noted. The curve obtained on joining the former points then brings out a number of facts, foremost among which are (1) that as long as the conditions remain constant the doubling periods - i.e. the times taken by any portion of the filament to double its length - are constant, because each cell is equally active along the whole length; (2) there are optimum, minimum and maximum temperatures, other conditions remaining constant, at which growth begins, runs at its best and is soon exhausted, respectively; (3) that the most rapid cell-division and maximum growth do not necessarily accord with the best conditions for the life of the organism; and (4) that any sudden alteration of temperature brings about a check, though a slow rise may accelerate growth (fig. 8). 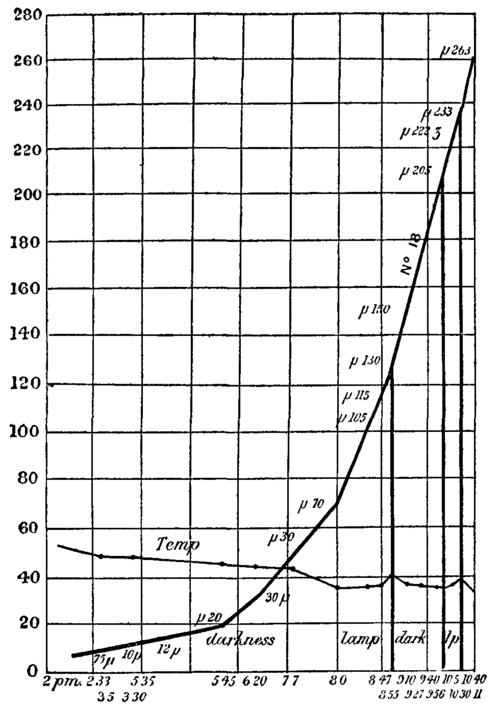 It was also shown that exposure to light, dilution or exhaustion of the food-media, the presence of traces of poisons or metabolic products check growth or even bring it to a standstill; and the death or injury of any single cell in the filamentous series shows its effect on the curve by lengthening the doubling period, because its potential progeny have been put out of play.